In Norse mythology, Ragnarok is a series of apocalyptic events that will define the end of the world, where giants of frost and fire will together fight the gods in a final battle that will ultimately destroy the planet, submerging it under water. According to the legend, the world will resurface, the surviving and returning gods will meet, and the world will be repopulated by two human survivors. Brothers will fight and kill each other, sisters' children will defile kinship. It is harsh in the world, whoredom rife —an axe age, a sword age —shields are riven— a wind age, a wolf age— before the world goes headlong. No man will have mercy on another. Norse mythology is divided in two major groups of gods – the Giants (Jotnar), Aesir, and Vanir. The Giants were the ones that came first and lived in in Jötunheimr, one of the nine worlds of Norse cosmology. They were banished there by the Aesir, who refused them entry to their world, Asgard. The Giants frequently interact with the Aesir and the Vanir, usually in opposition to, or in competition with them. The god Loki was the son of a Giant and was known as a trickster god with the ability to shape shift. His role in Norse mythology is unique and controversial since he appears to both help the gods and hinder them. He was also permitted to live with the Aesir in Asgard. Loki fathered many offspring, including an eight legged horse (Sleiphnir) used by Odin, a dragon, and the wolf Fenrir who plays his role in the apocalyptic Ragnarok. According to the story, Loki tricked the blind god of winter, Hod (Hoor), an action that resulted in the death of the god Balder , son of goddess Frigg and god Odin. 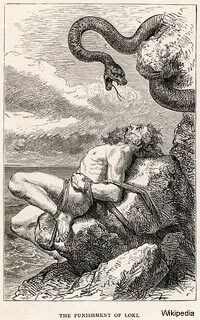 Because of this, he was punished and cast into a cliff where he was to remain bound until Ragnarok, the end of the world. This bears similarities to the punishment of Prometheus in ancient Greek mythology, who was bound to a rock for giving the ability to make fire to humanity. Like the Christian apocalypse, Ragnarok sets out a series of signs that will ultimately define the end of times. The first sign is the Fimbulvetr, a long and continuous cold winter with constant snow that will last for a year. A red rooster called Fjalar will warn the Giants that the Ragnarok has begun. A second rooster will warn all the dead that Ragnarok has begun. Finally, a third red rooster called Gullinkambi, a rooster that lives in Valhalla, a majestic hall located in Asgard, will warn all the gods about the beginning of the end. The god Heimdallr will use his trumpet to play a specific tone that will be heard in Valhalla, and this will bring the dead back to life and they will march to the realm called Vigrid (the place of battles), where the final battle will take place. The seas will be torn and the World Serpent, a serpent so large that he surrounds the earth and grasps his own tail, will raise itself from the depths of the oceans to join the battle. The gods Balder and Hod will also return from the dead to fight in this great final battle. Loki and his horde, as well as the frost Giants, will sail to Vigrid in order to battle against the Aesir on a ship made of the nails of dead men like a ghost ship. All monsters and giants like the flame giant Surtr, Hel’s dog Carm, the wolf Fenrir (Fenris), and the leader of the giants, Hrym, will create a powerful army against the gods. The result of the war will be that Thor and Odin and most of the gods will die, and the dragons will release fire that will destroy all life on Earth. But this is not the end. Things will start again with a new race, a new world will arise from the depths of the seas. The first two mortals will be called Lif (woman) and Lifthrasir (man) and they will repopulate Earth. The gods Vali and Vidar, as well as the sons of Thor and Hoenir, who survive the battle, will go to Idavoll, which will not be destroyed in Ragnarok. The gods Balder and Hoder will be returned to life and a new era will begin. The apocalyptic story of Ragnarok shows the battle between gods, a battle with severe consequences for both humans and gods. The humans are the ‘collateral damage’ in this war between the gods, much like in Hindu mythology. This distinguishes Ragnarok from the Christian apocalypse in which humans are punished for not being loyal and faithful to God. Mankind has been fascinated with the ‘end of times’ since as long as history has been recorded. In Christianity, it is the ‘Judgment Day’ described in the Book of Revelations; in Judaism, it is the Acharit hayamim; in Aztec mythology, it is the Legend of the Five Suns; and in Hindu mythology, it is the Story of Avatars and the Man on the Horse. Most of these myths maintain that when the world as we know it ends, a new incarnation of the world will be created. Are these myths and legends simply a metaphor for the cyclic nature of change seen in the rotations of day and night, the seasons, and the chains of life and death, or will humanity meet its end in the not so distant future? The usual want to have coitus today where is the money to do such. Beautiful artwork, Justbod! The things you make are amazing! I believe all the Apocolypse stories are metaphores for the changing of Earths cycles. All the stories are way too similar. "Are these myths and legends simply a metaphor for the cyclic nature of change seen in the rotations of day and night, the seasons, and the chains of life and death, or will humanity one day meet its end?" Yes they are a metaphor for the cycles of nature as clocked by the precession of the equinoxes. We have just moved from the age of Pisces to the age of Aquarius. The next 2135 years a going to be very different to the last. Firstly we must see the collapse of this civilis(z)ation as we are seeing the legs quiver in the death throws.